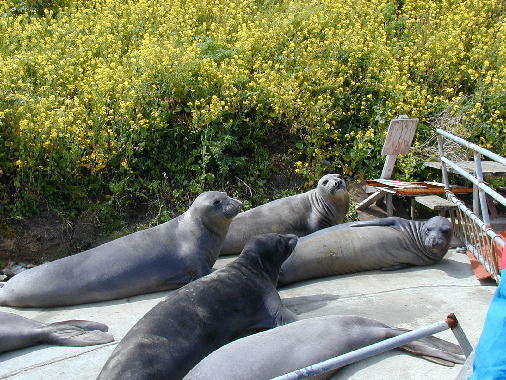 We lined up early at the entrance to Point Lobos California State Reserve in order to condense our carpools and beat the divers to a few parking spots at Stop 1, Whalers’ Cove. Kathleen Burnham, our leader for the next two days, overviewed the trip and the process we would use. At each stop, we would take 15 minutes to gather data then regroup to discuss our findings. 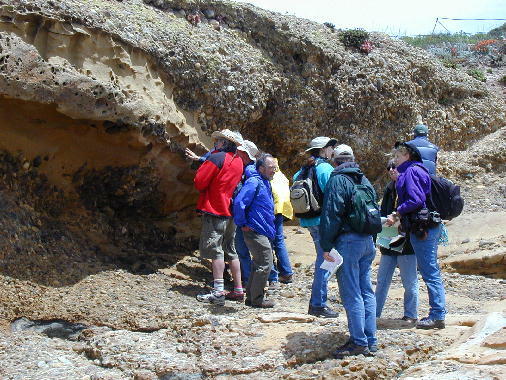 Later, we would compare what we observed here at Point Lobos to what we would see at Point Reyes, to begin to understand the story that Kathleen had to tell. 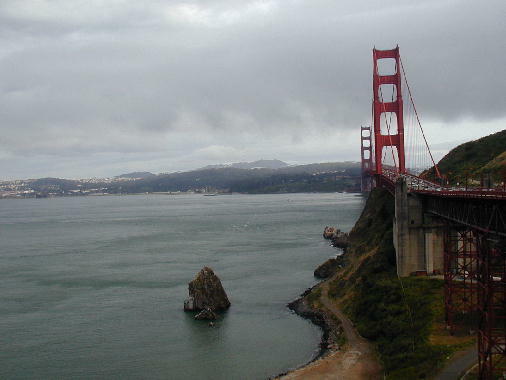 It’s the tale of similar rocks being transported ~180 km to the north along the San Gregorio and Northern San Andreas faults. 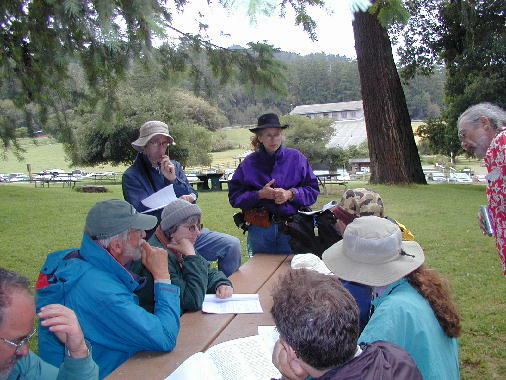 Given that this was a group of geology enthusiasts, far more observations were made than were requested by the blanks in the guidebook, and interpretation of it all prompted much discussion and debate. This made Phil Garbutt’s task rather challenging. Tridib Guha, who handled the pre-trip coordination work, had asked Mark Detterman to be field trip coordinator on the actual trip. Mark in turn asked Phil Garbutt to be the timekeeper. Just when things would get really involved, one could hear “tic tock tic tock” from Phil, like the Peter Pan crocodile coming around. 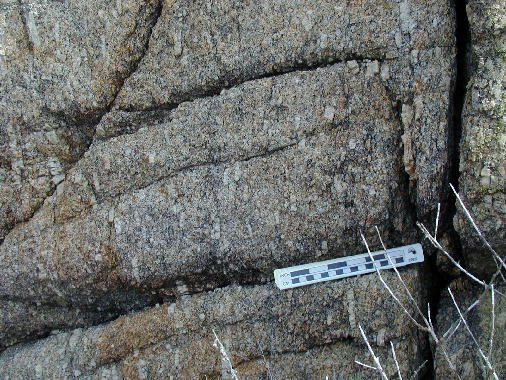 The granodiorite at Whalers’ Cove features exceptionally large K-feldspar crystals. Frank Darr measured one 9 cm long. These crystals have an unusual aspect ratio: they are long and narrow. They also exhibit Carlsbad twinning, with the intergrown crystals having opposite directions. 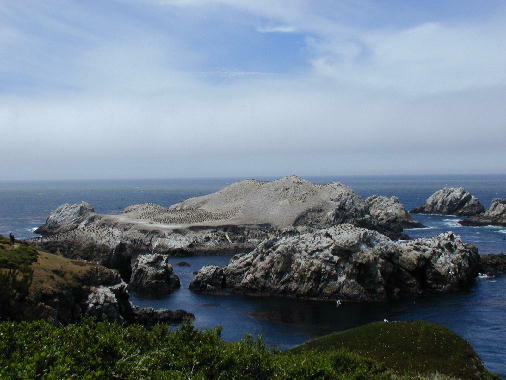 It was noted that this exact granodiorite is found, in the California Coast Ranges, only within 12 miles from here. Stop 2 took us around the cove, past some sleeping sea lions, to Granite Point. Or rather Granodiorite as Dave Mustart observed. Often. We stopped at a viewpoint on the way and speed-mapped what appeared to be depositional and fault contacts between the plutonic rock J and the conglomerates on the far cliff. Continuing down to the base of the point, we traveled through some middens: abalone shell debris left by Native Americans. 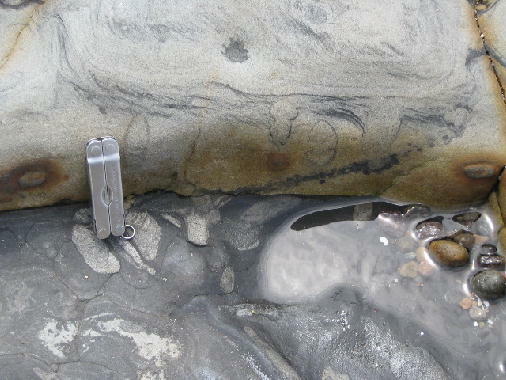 The base of the point revealed a depositional unconformity between the granodiorite and the conglomerate. 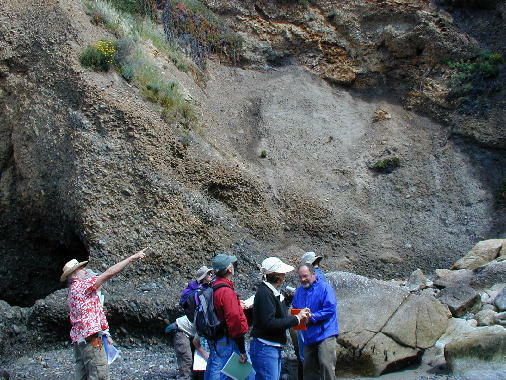 We reviewed events that occurred to create this contact: hot magma intruded upward, cooled and crystallized, five to 10 miles of overlying material eroded, a submarine canyon formed and conglomerate deposited, and finally it all was uplifted above sea level. 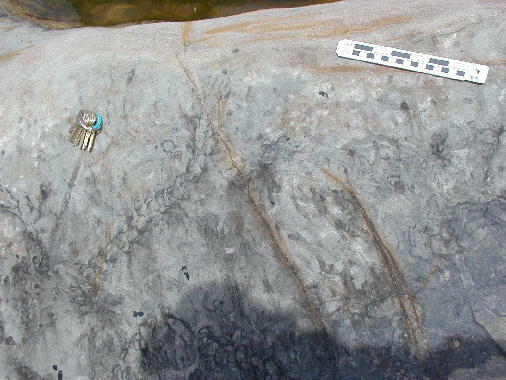 What had appeared to be another inexplicable contact is interpreted by Kathleen to be simply a large granodiorite clast, the largest one in the park. This was subject to debate of course. Tic tock, we move on. The Weston Beach plunging syncline was Stop 3. 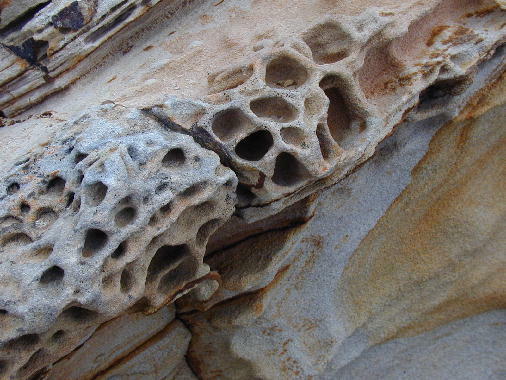 If we had been here about 50 million years earlier, we could have seen scolicia, chrondites, ophiomorpha and other marine organisms. Today, we only see evidence of their lives: their burrows, feeding traces, tracks and trails. 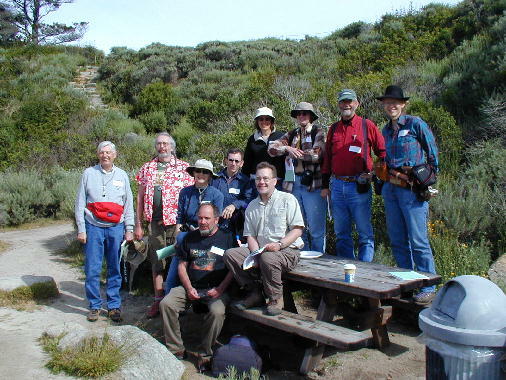 Ray Sullivan noted several fossil features and background on this environment, including that we were standing on a distal turbidite bed comprised of finer grained overbank deposits and that there were five 50-ft bedsets, aka sequences, in the park; we stood on the youngest one. 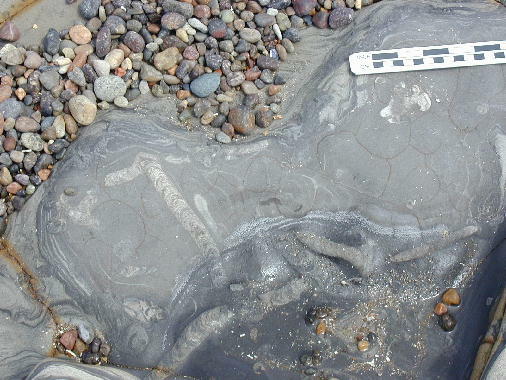 These beds also exhibited flame structures caused by the overlying beds squeezing the mudstone beneath. Other turbidite beds that we see later are coarser and therefore more proximal: closer to the center of the canyon. 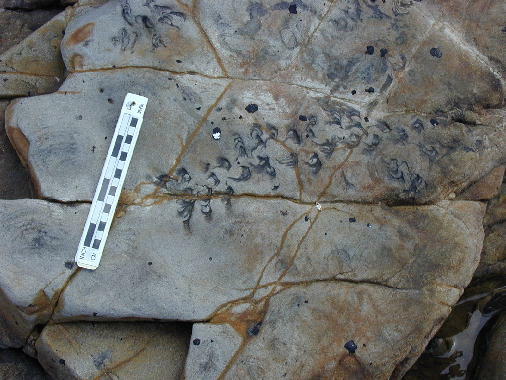 The Field Guide includes several references on the fossils. The featured fossil of course was the very special trace fossil, Hillichnus lobosensis, made by a bivalve mollusk. We saw traces over five feet long. 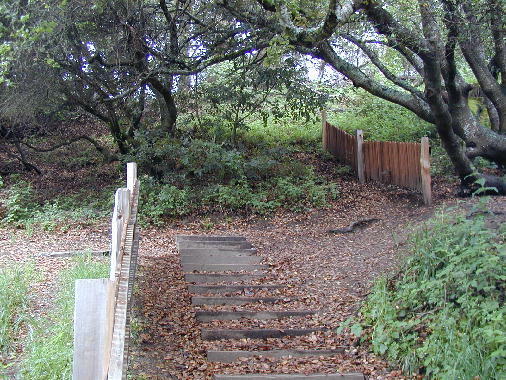 They are beautiful, unusual, and appear here and at Point Reyes. 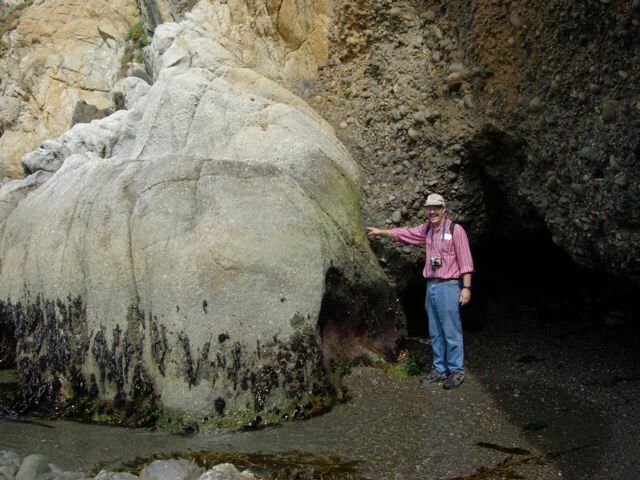 There was much to examine here but before Dave and Rolfe Erickson could conclude their discussion about concretions, tic tock we headed out to the next stop. Stop 4 brought us to Punta de los Lobos Marinos. Here we examined the Carmelo Formation conglomerate. 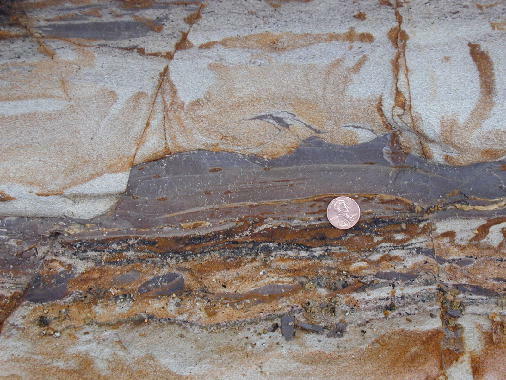 It is comprised mostly of rounded volcanic clasts, in a matrix of subangular grains from plutonic parent rock. 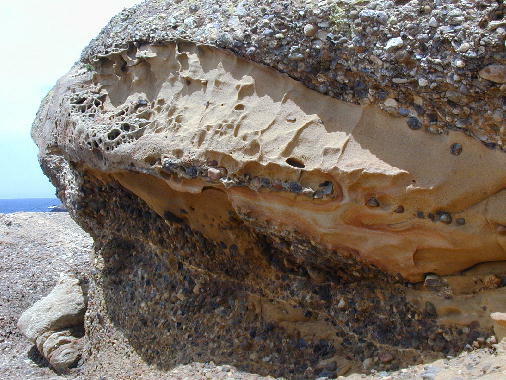 The source for the clasts is different from the source for the matrix: the source for the clasts is a volcano far away while the source for the matrix is the local canyon walls. We identified five types of clasts: purple volcanic with pink crystals, brick-red volcanic with white crystals, gray/buff tuff with fiamme, white tuff, and blue/buff siltstone. 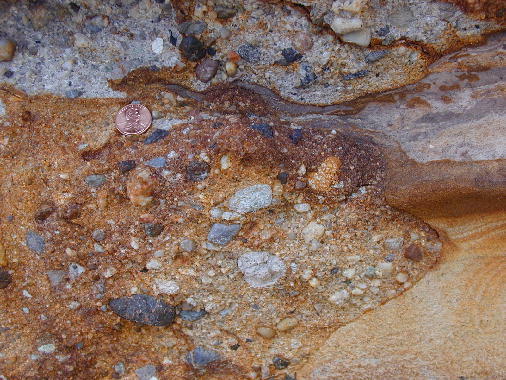 One could see stream imbrication in the pebbles of the conglomerates and liesegang banding in the sandstone. 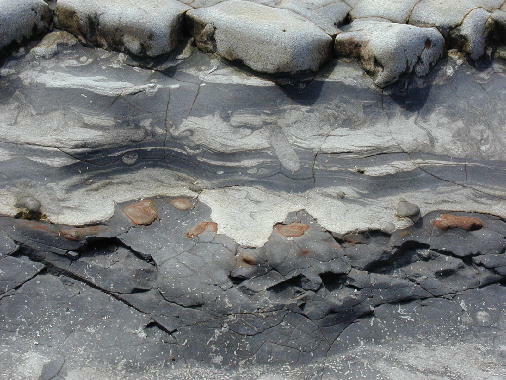 The turbidites had sharp contrasts between the finest, highest sediment and the sudden coarse beginning of a new bed, indicating paleo-up. 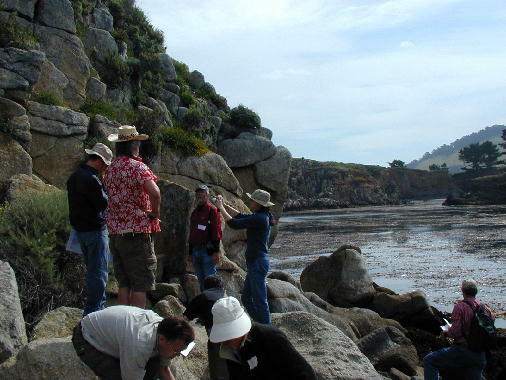 Punta de los Lobos Marinos is an attractive hangout for geologists. Ray and Dave suddenly saw a colleague that they had worked with many years ago, here on the beach, just looking at the rocks. A mini reunion ensued. 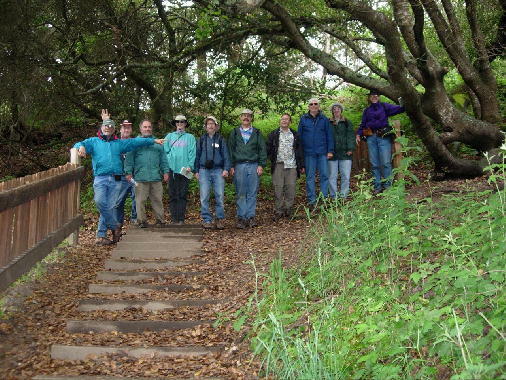 We headed north to Olema Campground at Point Reyes National Seashore. After getting settled we met for dinner at Café Reyes. Until this point we had been quite lucky with the weather. That changed with rain at 3:00 am but by then we were all tucked in. The following morning at the campsite we feasted on berries, yogurt, coffee, and the BEST pastries, still warm from the oven of a bakery in Inverness. All served from the tailgate of Anne’s truck, a convenient dry spot in the camp. At Drake’s Bay, Stop 5, we walked down picturesque Chimney Rock Road to the historic Lifeboat Station where we were stopped in our tracks. A formidable gang of marine mammals had control of the beach between us and the granodiorite that we had come so far to see. What to do? Employing good field geology sense of direction and balance, we made our way up the cliff, through the yellow flowering mustard, and finally back down to the granodiorite exposure. 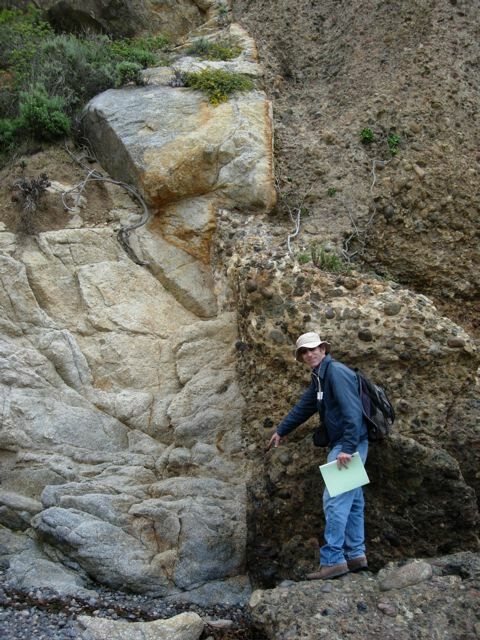 Here we examined the plutonic rock and compared it to its Point Lobos counterpart. It exhibited all the same minerals, including very large K-feldspars. 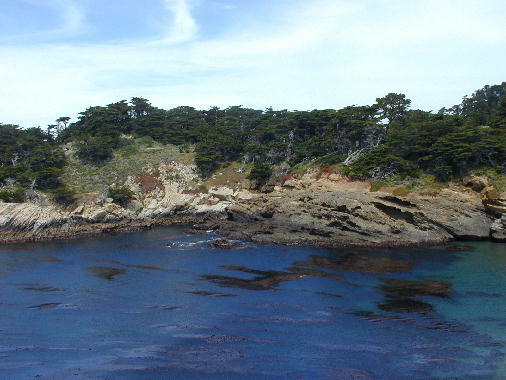 However, these K-spars were not as long as the ones at Point Lobos and did not have the same aspect ratio as at Point Lobos. 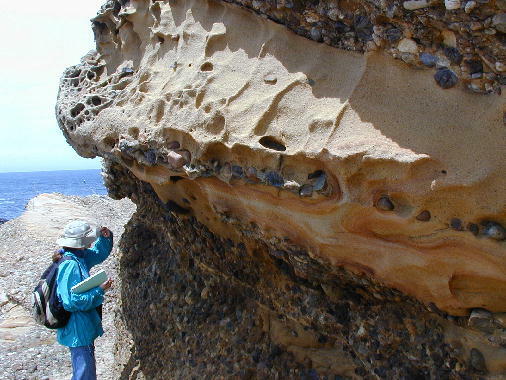 This is interpreted to indicate that the Point Reyes rock cooled faster, at the edge of the pluton while the Point Lobos rock enjoyed a longer cooling period more towards the center of the pluton. The rock was cross cut by several dikes. 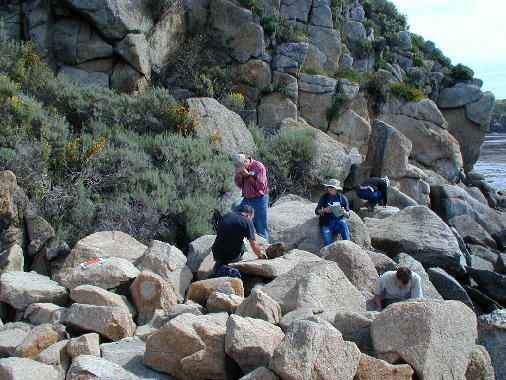 John Christian and Susan Panttaja climbed to a close-up view that Dave had pointed out: aplite, with sand sized crystals, cutting pegmatite, which in turn cut the granodiorite. The drive to the Point Reyes Lighthouse, Stop 6, took us through a riot of green grass, wildflowers and happy cows. On occasion, we had to stop to let them cross, which they did at their own happy-cow pace. 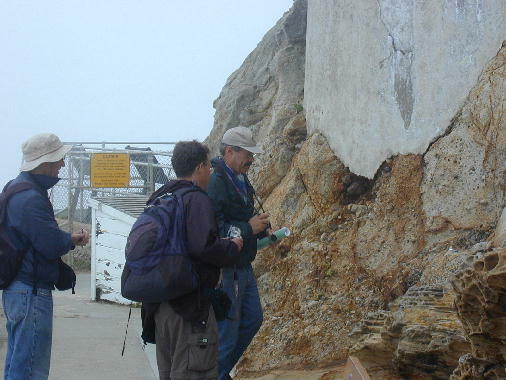 In the Point Reyes Conglomerate above the lighthouse, we identified all five clasts as seen at the other location, including the very beautiful purple porphyry. 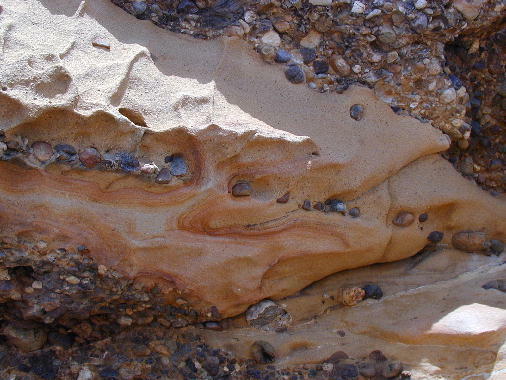 These clasts are a bit smaller and more rounded versus those in the Carmelo conglomerate at Point Lobos. 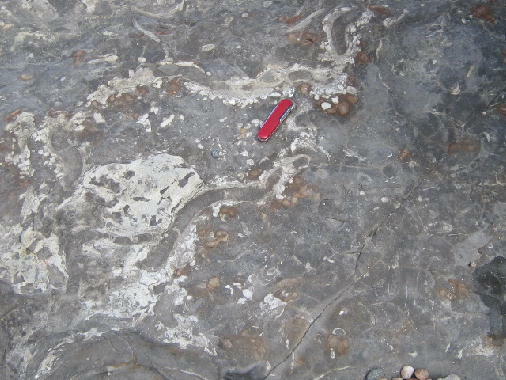 The same clasts and matrix indicate that the conglomerates both originated in the same submarine canyon while the smaller size and more rounded shape indicate that this was deposited further away from the source, downstream from where the Carmelo conglomerate was deposited. 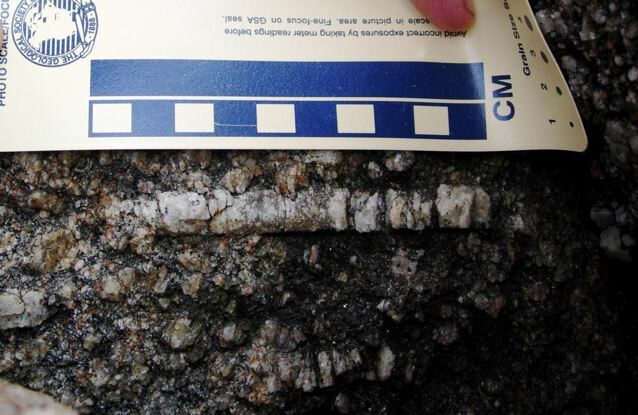 Here and there, we also saw large granodiorite clasts (boulder-sized) with K-spar crystals of the same long and narrow aspect ratio that we saw at Point Lobos. Kathleen, Ray, Dave, Rolfe and others also pointed out many features such as mud cut-ups, some small normal faults, trace fossils and had a nice debate about sole marks versus scours. Lunch was at the picnic grounds at Stop 7, the Bear Valley Visitors Center. Since this trip was part of the commemoration of the 1906 earthquake, it seemed fitting that we walk the Earthquake Trail together. The trail has excellent new interpretive signs along the way. 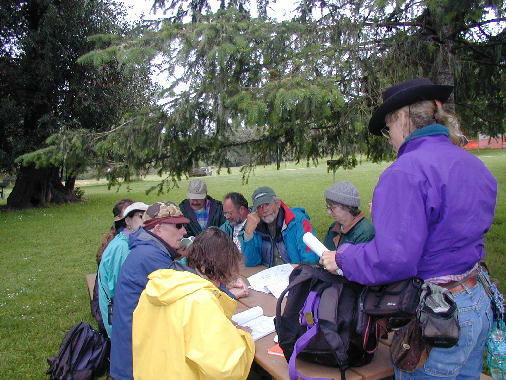 Of course (tic, tock) not everyone agreed with all the information on all the signs and so we debated to the end, thus turning a simple tourist trail into another major geological expedition. 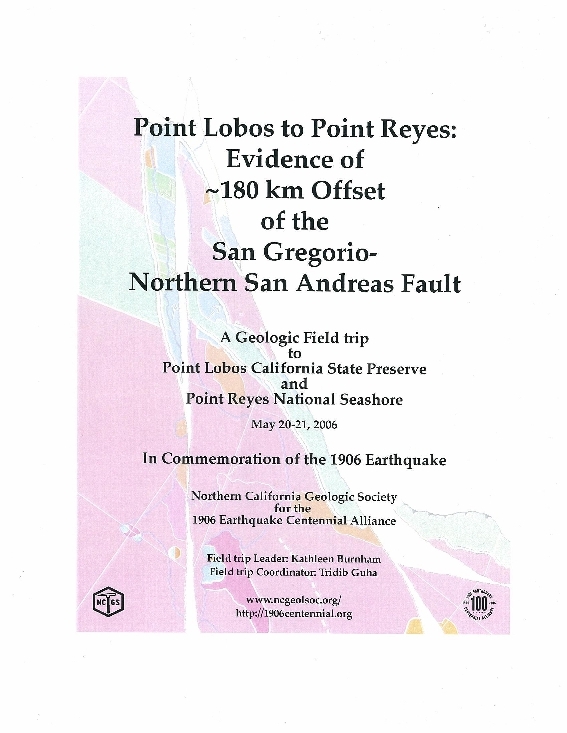 Space prohibits the author from relating the various hypotheses presented regarding the San Andreas Fault zone. 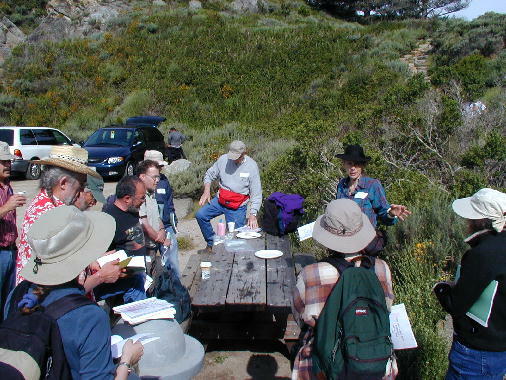 The NGCS is grateful to Kathleen Burnham for leading this interactive field trip to Point Lobos and Point Reyes, and for the presentation she gave at the April 26, 2006 NCGS meeting. The NCGS also thanks Tridib Guha, Mark Detterman and Phil Garbutt for logistics support and thanks all the participants for their interaction and for sharing their knowledge and observations with each other throughout the trip.